By Bill Adair on Wednesday, July 27th, 2011 at 7:41 a.m. Starting today, Mostly False will replace Barely True. Barely True has served us well. On our national site, for example, we've awarded 267 Barely Trues since we launched in 2007, accounting for 13 percent of our ratings. But over the years, we heard many complaints about the rating. Many readers said it put too much emphasis on "true" when the rating actually describes something without much truth. Three weeks ago, we floated the possibility that we might change the meter and asked for feedback. We got an avalanche. We got hundreds of messages through Twitter, more than 1,000 posts on Facebook and more than 850 e-mails. At least 95 percent of them supported the change. "Anything less than Half True should contain the word false, and anything more than Half True should contain the word true. It's a much clearer indicator how much truth a statement contains, and it just makes more sense." False shows by its own qualifier that it the information is predominately inaccurate. You've already seen how it has been manipulated and it can actually lead to adding some kind of credibility to their assertions." "The most insidious of falsehoods are those with a grain of truth to them, so it would be very appropriate to change to Mostly False." "Thank ‘Barely True’ for its service and send it off to a cushy retirement." 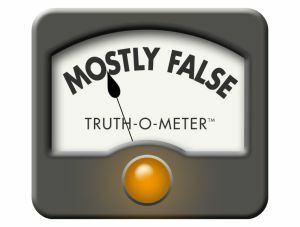 Starting today, Mostly False is replacing Barely True on all PolitiFact sites. The definition will remain the same -- "The statement contains an element of truth but ignores critical facts that would give a different impression" -- and the meter will retain the same orange bulb. The Mostly False meter will appear on past claims that were rated Barely True, but those articles will be appended with an editor's note that will explain the original rating. If you own the PolitiFact app for iPhone, iPad or other devices, the Mostly False meter should replace Barely True in the next day or two.